A Drishti-Niche event presented by Iowa Corridor Sangeet. Supported, in part, by a grant from Humanities Iowa (National Endowment for the Humanities) and by sponsorship from Hills Bank and Trust and the University of Iowa Community Credit Union. 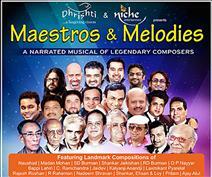 Iowa Corridor Sangeet presents a Drishti-Niche event: Maestros & Melodies: A Tribute to Legendary Bollywood Composers. This is a live music program that pays tribute to the works of 30+ Bollywood music directors. This 13-member team is packed with amazing talent that includes exquisite narration, live music and singing. The program is a scripted show interspersed with movie clips and narration. The show has been conceptualized by Madan Kulkarni of Drishti and is directed by Milind Oak of Niche Entertainment, who has in the past given us some remarkable and popular musicals like Black and White, 100 Years of Bollywood, Yahoo, Bhairav se Bhairavi, Trendsetters, Gulzar ... Baat Pashmine Ki, Gaata Rahe Mera Dil, Pancham, and many more. Doors open at 6:30 PM, and the concert begins at 7:00 PM.